On September 19, 2011 Tyco announced that they would be splitting themselves into 3 publicly traded, independent companies. This is important news for the security industry as 2 of those new companies would be security focused organizations. In this note, we examine how this is being done, what this means for the industry and what financial numbers are being revealed in the process. ADT North American Residential, projected 2011 revenue of $3.1 Billion, that does not include their commercial security/integration business. This is essentially the alarm monitoring business. 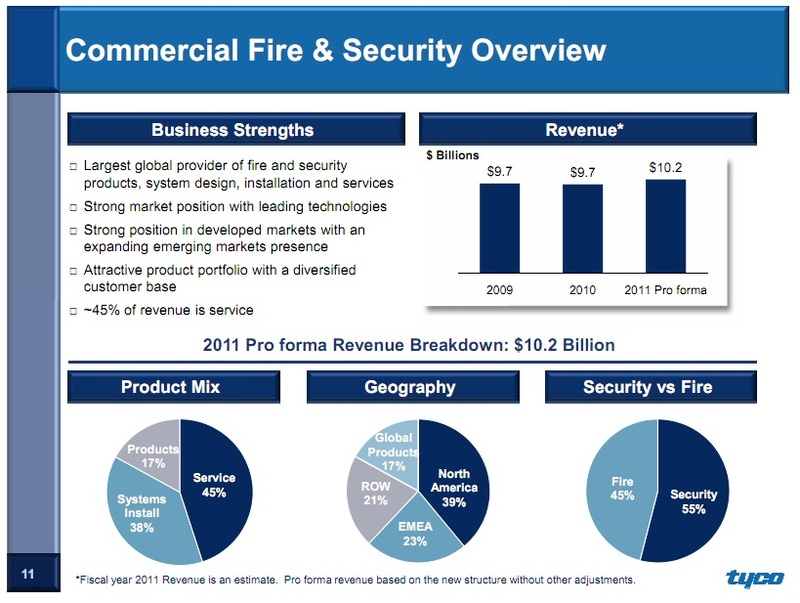 Commercial Fire and Security, projeted 2011 revenue of $10.2 Billion, that importantly includes both their product companies (like American Dynamics) and their commercial integration business. In practical terms, the 'independence' gained will not be much of a significant change for the professional security markets. Many industry people dislike or distrust the combination of product and integrator businesses in a single company (as ADT/Tyco Security Products has been for years). Unfortunately for them, this split does not change that structure. While the name of this company will likely change, this Tyco spinoff will still be manufacutring products as well as integrating them in the commercial / government / professional markets. However, the best practical benefit is likely to be the increased visibility into financial performance of the split companies. Historically, Tyco International, the current conglomerate, provided some high level statistics but they were not detailed at all. Security Product's annual revenue of $935 Million is split amongst video, access control, etc.